In today’s world of computer controlled milling machines, plasma cutters and don’t get me started on 3D printers, forging hot steel by hand has become obsolete. Forging metal is all about tradition, dedicating years of your life to learning skills so you can hammer, bend and mold an object from your imagination. A decade ago if you wanted to learn a new skill or forging technique you had to find someone that knew it, travel to where they were, and hope you could talk them into teaching you. Journeymen spent years as apprentices learning from one or two master smiths. With the advent of Youtube, Facebook and every other means of digital communication, learning new skills as a smith has become the easiest it has ever been. Don’t get me wrong there is no replacement for face to face communication and time spent together forging with someone, but that time can be exponentially more valuable if it is supported with hours of communication and learning before and after. Forging has seen a huge resurgence in popularity these days. For a select few it is even a viable way to make a living. Even with all these advantages I am sure my nephew would much rather just use a 3D printer. I have always enjoyed heating metal and bending it or hammering on it. I have always been intrigued by the blacksmith displays at historical parks. However, I got into forging, not to continue the tradition, but because it was the best way to achieve my goals. I wanted to build axes. Axes are one of the few things left that still require forging. Like any newbie I figured I would get an anvil and a forge, and start making axes. There is a lot more to it than that. Lots of tools are required to make a quality axe and those tools require skills to make them. The more time I spent forging and growing my skills, the more things I found I wanted to make. I soon found myself immersed in a new world, with new friends, new mentors and new places to travel to. And this ancient world that was new to me had its own religion. Like any group of people that share a similar passion, there is an unspoken dress code and a hierarchy among the participants. Thankfully neither of those are very enforced by blacksmiths, especially compared to some groups I have been around (cowboy culture, I am looking at you.) But the one thing blacksmithing culture has more than any other group, is a religion. Puritan true believers only use coal forges and never use power tools. Building tools and farm equipment the same way it was done a hundred years age. The new age separatists use propane forges and MIG welders. They make art solely for the sake of art. I love the nostalgia of a coal forge and banging away on horseshoes at the livery stable, but I am in this for results and productivity. There are those that believe a finished product should show no sign of the original stock it was forged from. This takes time and a lot of force, aka a power hammer. I prefer to start with material as close to the end result as possible and achieve that goal with the least work possible. Setting up a forge at the local historical fort and using tools only available for that time period is a lot of fun when the fifth graders come to visit. There just is not enough of a market for hand forged nails to support a family that way. Plus I doubt my elbow would survive. I am result focused. I started forging because I wanted a specific outcome, not because I wanted to learn the process. If using an electric welder works I will do it, forge welding is hard and takes lots of practice. Why would I hot punch a hole when my uncle gave me a perfectly good drill press. A hundred years ago forging was the most efficient way to make things. If a smith had a Miller electric welder a hundred years ago, you better believe they would have used it. I sell most everything I make which means I need to make things the most efficient way I can. I once had a guy point out that I had not forge welded a tool I was selling, why on earth would I spend the time and effort to forge weld a tool I was going to sell. The deeper I venture into this world the more interested I become in doing things the hard way or the more traditional way. As my skills increase and my confidence grows I find myself more interested in the process than concerning myself with completing the project. 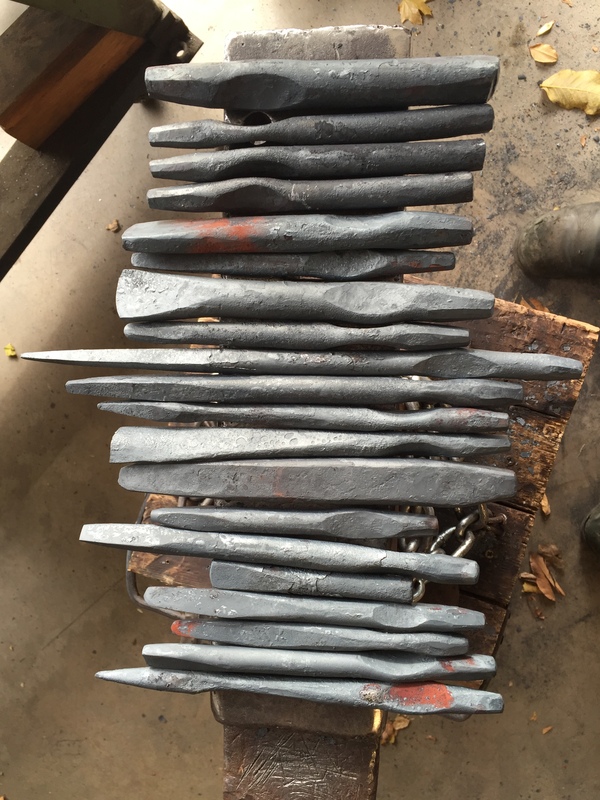 I am in the process of replacing all my store bought forging hammers with hammers I have made. Having good quality hammers will help prevent injuries, but truthfully it’s just cool. I want to learn the process and have the skills to do it. When other smiths see me using hammers I have built they can see I am a good enough smith that I built my own hammers and respect me for it. When clients see my tools they will be interested and impressed, hopefully enough to buy something. Speaking of hammers I don’t even know where to start on the cult like commitment to rounding hammers or cross peen hammers I see with some smiths. Personally I use both because they each have their advantages. Like all religions there are groups of people that disagree on the finer details of things. The main divide with the religion of blacksmithing is a separation between those that are there solely to preserve the historical traditions and those that are there to create new and intriguing things. I hate the idea of limiting my creativity for any reason. And deciding what time frame in history, “true” blacksmithing is trying to preserve, can be difficult. I picture myself on a homestead in the west, after the civil war making horseshoes and hardware for wagons. Others may see themselves in England during WWI supporting the war effort. There is not enough interest from clients in how things are made to justify using only “traditional” methods. I will let you decide how old “traditional” is. Most people enjoy that they are buying something handcrafted, they are not concerned if you made it with power tools or not. The current state of my blacksmithing religion is one of efficiency and profitability. One day when I have become a successful artist with plenty of time I shall devote myself to the purer faith. I will lay down my angle grinder and my electric drill press. I will take take up the hand crank coal forge. Or wait, will it be a charcoal forge with a leather bellows, what time frame did we decide “traditional blacksmithing” was? Well said, Than. I especially like your thoughts about not limiting your creativity, and about using the most effective tools and processes, regardless of whether they are considered traditional or new. Next How Long Have You Been Doing This Sort of Thing?